Luther Wade Pilcher was born in Dothan, Alabama on January 1, 1898 to Richard and Della Pilcher, the second of their five children. In 1910, the family moved to Noma, Florida, though Pilcher's last known residence was in Chipley, Florida. Pilcher enlisted in the U.S. Marine Corps on May 4, 1915, and served from 1915-1917 in Haiti and Cuba. After the U.S. entered the Great War, the 5th Marine Regiment was activated in Philadelphia, Pennsylvania. As part of the regiment, Pilcher shipped out to France in August of 1917, arriving in France on the 22nd. The 5th was among the first of the American Expeditionary Forces to arrive in Europe. Pilcher and his regiment took part in the Battle of Belleau Wood (June 1-26) against the Germans in 1918. The battle became a defining moment in Marine Corps history, as the troops succesfully stalled the German advance toward Paris. However, the bloodiest day of the battle, June 6th, saw Pilcher, among many others, killed in action. He posthumously received the Distinguished Service Cross, the Navy Cross, and the French Fourragere for his service and sacrifice. 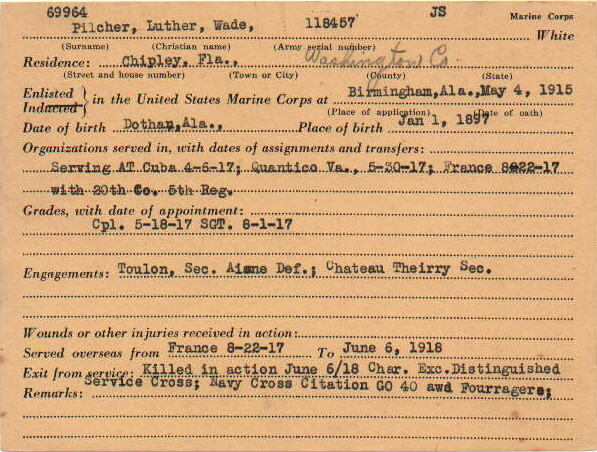 Pilcher is buried in the Aisne-Marne American Cemetery at Plot B Row 10 Grave 68 in Belleau, France. Digital reproduction of original service card. "Aisne-Marne American Cemetery." FL-GenWeb Project, Inc. Accessed June 22, 2018. http://fl-genweb.org/mpc/citrus/military/am_cem.html. "Luther Wade Pilcher." FloridaMemory.com. Accessed June 22, 2018. https://www.floridamemory.com/items/show/209562. "Series Description." FloridaMemory.com. Accessed June 29, 2018. https://www.floridamemory.com/collections/wwi/series.php. The Florida Department of Military Affairs. “U.S. 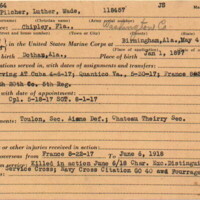 Marine Corps Service Card, 1925.” RICHES of Central Florida accessed April 23, 2019, https://richesmi.cah.ucf.edu/omeka/items/show/10387.